Turbines on Heifer Hill that are part of the Bull Hill Wind Project put up by First Wind in Township 16 in Hancock County. OSBORN, Maine — The state Department of Inland Fisheries and Wildlife has taken at least some of the wind out of the sails of a planned SunEdison commercial wind farm in Hancock County by opposing the project out of concern for bats and birds. The proposed Weaver Wind farm would consist of 23 turbines, each nearly 600 feet tall, eight of which would be in Eastbrook and 15 of which would be in Osborn. Studies of the proposed project site — which would abut the Bull Hill Wind farm in Township 16, where 19 turbines, each 476 feet tall, were erected in 2012 — show the potential impact on migrating birds could be relatively high, according to state officials. A June 15 draft analysis written by staff at the state Department of Environmental Protection indicates the impact of the Bull Hill Wind site on birds already is estimated to be significant. The addition of more turbines in the area — including 18 in a third, already permitted but not yet constructed SunEdison project called Hancock Wind — would make the cumulative effect even more so. DEP is planning to hold a public meeting about the Weaver Wind project at 6 p.m., Monday, June 22, at Airline Community School in Aurora. In all, SunEdison, which acquired First Wind earlier this year, is proposing to have 60 commercial-scale turbines operating on several ridges in Eastbrook, Osborn, Township 16 and Township 22. According to the report, a nighttime analysis during the 2014 spring migration season indicated an average of about 800 birds or bats flew through a kilometerwide swath of the Weaver Wind project area every hour, and on one night the estimated passage rate exceeded 2,500 birds, or bats per hour. Other analyses performed at the Bull Hill site yielded lesser average hourly nighttime passage rates of 387 birds and bats — called “targets” in the report — in spring 2010, 519 in spring 2011 and 614 in fall 2009. DIF&W indicated mortality rates “at or above” the highest levels reported in Maine likely would occur consistently at the Weaver Wind site and could result in “large spikes” under certain atmospheric conditions during spring or fall migration seasons, according to the DEP analysis. Specific mortality figures for the Bull Hill site were not cited in the DEP analysis. Officials with DIF&W said Friday mortality studies have suggested that, over a period of several months, a dozen or more birds or bats are killed by each of the 19 turbines erected in Township 16. Because of declines in Maine’s bat population, birds are believed to be more heavily represented than bats in the estimated passage and mortality rates. Officials with SunEdison did not dispute the figures cited in the DEP analysis or by DIF&W officials Friday. The data were compiled by consulting firm Stantec, which was hired by the windpower developer, and was reviewed by the state agencies. SunEdison officials said Friday that Stantec has discovered a miscalculation in its data and has since come up with corrected figures that are lower than its original estimates. 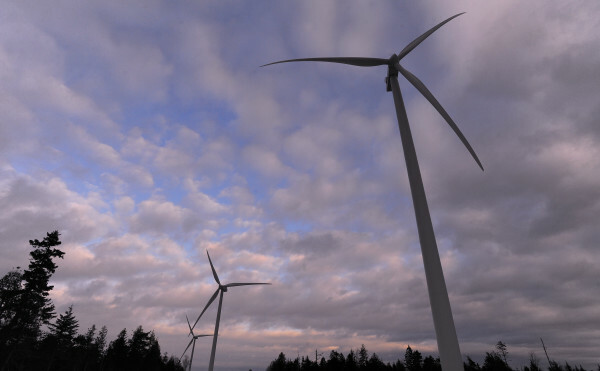 Officials with DIF&W, however, said they have seen the revised figures and still consider them to be high compared to other passage and mortality rates for other windpower projects in Maine and the region. SunEdison officials did dispute that characterization. The turbines at Bull Hill, like all large turbines in Maine and elsewhere, do have an impact on individual animals but have not had an overall adverse impact on any bird populations, they said. David Fowler, who has been spearheading the permitting process for the three Hancock County projects, first for First Wind and now for SunEdison, said Friday the developer disagrees with DIF&W over what constitutes an “undue” impact. The overall population of songbirds is in the “billions,” he said. “There is a far greater impact [on songbirds] from other types of development,” Fowler said. Sally Stockwell, conservation director for Maine Audubon, declined to comment Friday specifically on the avian passage and mortality estimates for the Hancock County projects, saying the organization has yet to see the revised figures. But she did say in an email that the Maine Audubon was concerned about the initial estimate that each Bull Hill turbine kills about 20 birds over a period of several months. She added that turbine operators can take steps to minimize the impact their projects have on birds. Mark Bergeron of DEP’s land resources regulation division said Friday the recommendation from DIF&W does not automatically mean the project would be rejected. He said the agency still is in discussions with SunEdison about the project and plans to gather public feedback about it at the June 22 meeting in Aurora. Bergeron said that, as with any DEP-approved wind farm, the agency would have leverage to get the developer to mitigate its impact on wildlife, even after it is constructed and begins operation. “DEP has not made a final determination on the [Weaver Wind] project,” Bergeron said.